Citric Acid, Natural & Artificial Flavors, Silicon Dioxide, Sucralose, Polydextrose, Acesulfame Potassium, FD&C Blue #1. Take one serving (1 scoop) of N03 Ultimate™, mixed with 8-10 fl. Oz. of water 20-30 minutes before training. 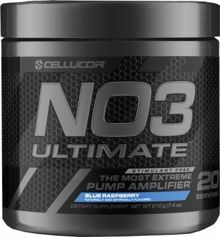 Visit www.cellucor.com/no3ultimate for directions on how to enhance performance by stacking with your favorite pre-workout product. THIS PRODUCT IS ONLY INTENDED TO BE CONSUMED BY HEATLHY ADULTS, 18 YEARS OF AGE OR OLDER. Do not use this product if you are pregnant, nursing, or are currently taking nitrates for chest pain or if you are taking medication used to treat erectile dysfunction such as PDE-5 inhibitors. This product contains nitrates and generally should not be used in combination with other products containing nitrates. Visit www.cellucor.com/no3ultimate for more details. Before using this product, consult a licensed, qualified, health care professional, including but not limited to, if you have high or low blood pressure, if you are taking any prescription drug or over-the-counter medication, or have any existing medical condition. Discontinue use 2 weeks prior to surgery. Immediately discontinue use and contact a medical doctor if you experience any adverse reaction to this product. Do not use this product continuously for more than 8 weeks. Do not use if safety seal is broken or missing. Store in a cool, dry place. KEEP OUT OF REACH OF CHILDREN. This product is sold by weight, not volume. Some settling of powder may occur during shipping and handling, which may affect density of powder. This product contains the servings indicated when measured exactly by weight. Citric Acid, Natural & Artificial Flavors, Silicon Dioxide, Polydextrose, Sucralose, Acesulfame Potassium, FD&C Red #40. Citric Acid, Malic Acid, Polydextrose, Natural & Artificial Flavors, Silicon Dioxide, Sucralose, Acesulfame Potassium, FD&C Red #40. A Pump Unlike Any Other*. We Didn't Create The Nitric Oxide Category...We Made It Better!